This study examines the way feminist academic literature discusses experiences of women combatants in non-state armed groups in Sierra Leone and Liberia. 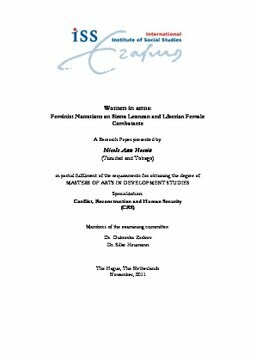 These views are contrasted with the combatants’ own narratives of their experiences with the intention of illustrating how feminist academic researchers bring their own agendas and interests into the research process, and do not always depart from the priorities and experiential knowledge of women combatants. This desk-based study reviewed a broad range of feminist literature on women combatants and selected literature written from a feminist perspective that claimed to include the ‘voice’ of female combatants. This literature was contrasted with a key text written by three former women combatants covering experiences from Sierra Leone and Liberia to contrast the priorities and concerns of the texts. The main focuses of the feminist literature were sexual violence, victimhood versus perpetrator identities, and questions of agency, while the key priorities and concerns for the female ex-combatants were obtaining an education as a way to retain, and then return to a ‘normal life’; the importance of both professional work (e.g. nursing); and of negotiating security through relationships, including intimate relationships. The former women in arms made less emphasis on sexual violence and victimhood, and more focus on career, education and vital interpersonal relationships which are themes not often reflected in feminist literature, that uses the ‘voices’ of women combatants mainly to legitimise their own concerns. This research thus hopes to contribute to enriching our understanding of the task that feminists still face in giving a voice to former women combatants more generally - can they indeed represent the priorities and concerns of former women combatants?